President George H.W. 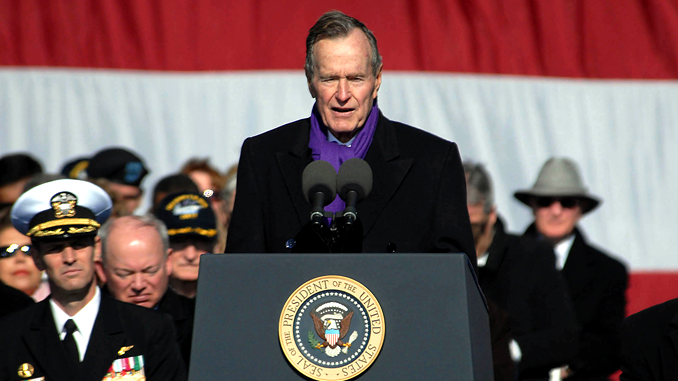 Bush addresses delivers his remarks at the commissioning ceremony for the aircraft carrier USS George H.W. Bush. Photo by MC4 Blechner(USN). Wednesday in the Nations Capital both former and current politician’s gathered to say goodbye to George Herbert Walker Bush, husband, father, grandfather, great-grandfather, and the 41st President of the United States of America. Thursday President Bush will be honored at St. Martin’s Episcopal Church located in Houston, Texas. After the funeral service President Bush’s remains will be transported by train to his final resting place next to his wife Barbra and daughter Robin. Former President George W. Bush greets President Trump and former Presidents Obama, Clinton and Carter at State Funeral for President George H.W. Bush.